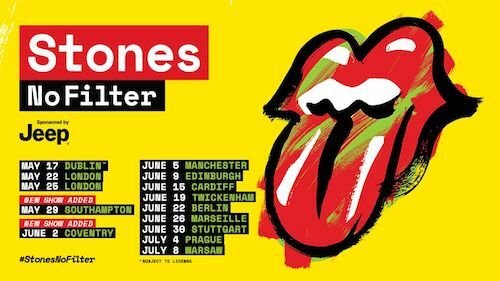 Although many of the tunes performed in Warsaw were also played at the beginning of the tour (it’s not as if they could get away with skipping “Jumpin’ Jack Flash” or “Brown Sugar”), the song order was quite different by the end of the tour. The opening number at that maiden Hamburg gig had been “Sympathy for the Devil” (see show recap here), whereas by last night’s gig that extravaganza had moved down to the 12th position on the setlist. “Street Fighting Man” had occupied a position toward the end of the show at the September gig. Several songs that were included in the early shows, including “Dancing With Mr. D” and the Keith Richards Exile on Main Street showcase “Happy,” had been replaced by the end of the tour, which included a cover of Bob Dylan’s “Like a Rolling Stone” and Keith’s back-to-back “You Got the Silver” and “Before They Make Me Run.” Surviving the setlist from #No Filter’s beginning to end was “Just Your Fool,” the Little Walter cover that opens Blue & Lonesome, the band’s 2016 album of blues cover songs. Also, where the tour-opener consisted of 22 songs, by Warsaw they were down to 19 total.